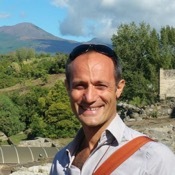 Traveler Review for Private Tour in Naples, Campania, Italy by Tour Guide Fabrizio B. About Fabrizio B. Message Fabrizio B. We departed the ship a few minutes early and Fabrizio and his driver were already waiting. They were welcoming and very professional. Fabrizio was open to tailoring his tour to meet any needs we had and was very knowledgeable. Both Fabrizio and his driver had a good sense of humour and this made them excellent company! I would definitely recommend Fabrizio for your tour and would use tours by locals again without hesitation. TOUR GUIDE RESPONSE: Thank you Esther, I really enjoied your company and your family, see you next time, ciao!